Plato (or rather the Egyptian priest speaking through Plato) may have been the first one to note the differential survival of people as a result of natural catastrophes. It is hard to imagine that such an extreme event would not unbalance agricultural economies leading to famine and also endanger the supply systems on which early cities were based. The failure of cities would in turn lead to a failure of governing elites centered on them and a power vacuum which new elites (armed with bronze weapons at this time) might take advantage of. Climate may have ended the Bronze Age civilization itself 1000 years later. Laura M Huckins et al. The Wellcome Trust Case Control Consortium 3 anorexia nervosa genome-wide association scan includes 2907 cases from 15 different populations of European origin genotyped on the Illumina 670K chip. We compared methods for identifying population stratification, and suggest list of markers that may help to counter this problem. It is usual to identify population structure in such studies using only common variants with minor allele frequency (MAF) >5%; we find that this may result in highly informative SNPs being discarded, and suggest that instead all SNPs with MAF >1% may be used. We established informative axes of variation identified via principal component analysis and highlight important features of the genetic structure of diverse European-descent populations, some studied for the first time at this scale. 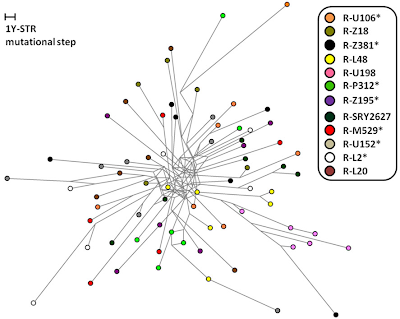 Finally, we investigated the substructure within each of these 15 populations and identified SNPs that help capture hidden stratification. This work can provide information regarding the designing and interpretation of association results in the International Consortia. ...but apparently not in Denisovans who accumulated deleterious mutations at a higher rate than modern humans. This may account for the fact that we haven't been able to find many Denisovans in the archaeological record as they may simply be a population that "failed" -- although apparently some distant relatives of the single Denisovan genome did admix into Australasians. Non-African populations have experienced major bottlenecks in the time since their split from West Africans, which has led to the hypothesis that natural selection to remove weakly deleterious mutations may have been less effective in non-Africans. To directly test this hypothesis, we measure the per-genome accumulation of deleterious mutations across diverse humans. We fail to detect any significant differences, but find that archaic Denisovans accumulated non-synonymous mutations at a higher rate than modern humans, consistent with the longer separation time of modern and archaic humans. We also revisit the empirical patterns that have been interpreted as evidence for less effective removal of deleterious mutations in non-Africans than in West Africans, and show they are not driven by differences in selection after population separation, but by neutral evolution. The Qesem Cave mandibular premolars and molar from a morphometric perspective. 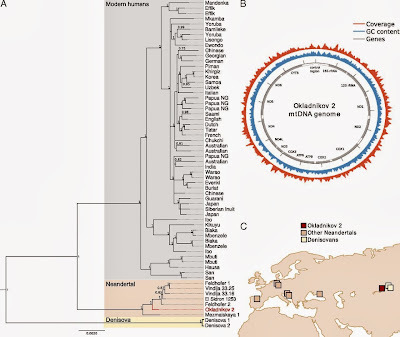 A string of recent papers argued for admixture in human populations at time scales from the Middle Pleistocene to recent centuries. A new paper in Science makes the point convincingly for extensive admixture in humans over the last few thousand years. The authors include the creators of Chromopainter/fineStructure software; the new "Globetrotter" method appears to be a natural extension of that method that seemed to work wonderfully well except for the limitation of producing only a tree of the studied populations. The paper has a companion website in which you can look up the admixture history of individual populations. 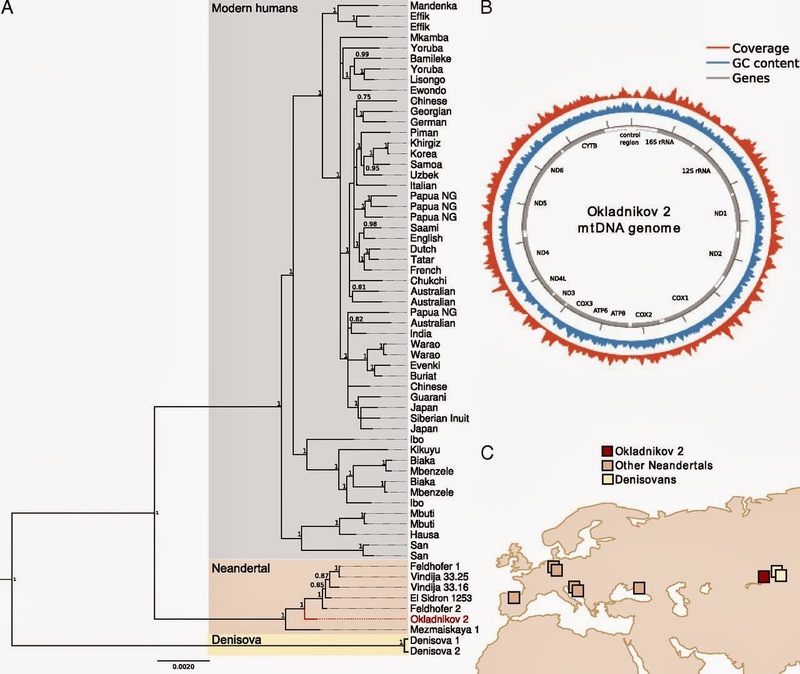 An exception to the rule that populations at the edges of the human range appear to be unadmixed are the Armenians who appear to be the only * between the Atlantic and Pacific in Figure 2D (shown at the beginning of this post). The companion site lists their status as "uncertain". Other results are more questionable; for example, the authors assert that Sardinians are an admixed population with one side being "Egyptian-like" and the other "French-like" whereas the ancient DNA evidence as it stands would rather indicate that Sardinians are the best approximation of Neolithic Europeans currently in existence and so are more likely to (mostly) possess a gene pool that traces back to ~8-9 thousand years in Europe. It will be quite the surprise if so many Europeans from 5kya or earlier look like modern Sardinians and ancient Sardinians don't! The analysis of Eastern Europe is particularly interesting as it documents three way admixture (Northern/Southern/NE Asian) in most populations but two way admixture (Northern/Southern) in Greeks, estimated at ~37%. The authors claim that this is related to the Slavs, which seems reasonable given the 1,054AD age estimate. On the other hand, according to the companion website, the southern element in Greeks is inferred to be Cypriot-like and it's far from clear that the pre-Slavic population of Greece was Cypriot-like or indeed represented by any of the populations in the authors' dataset. 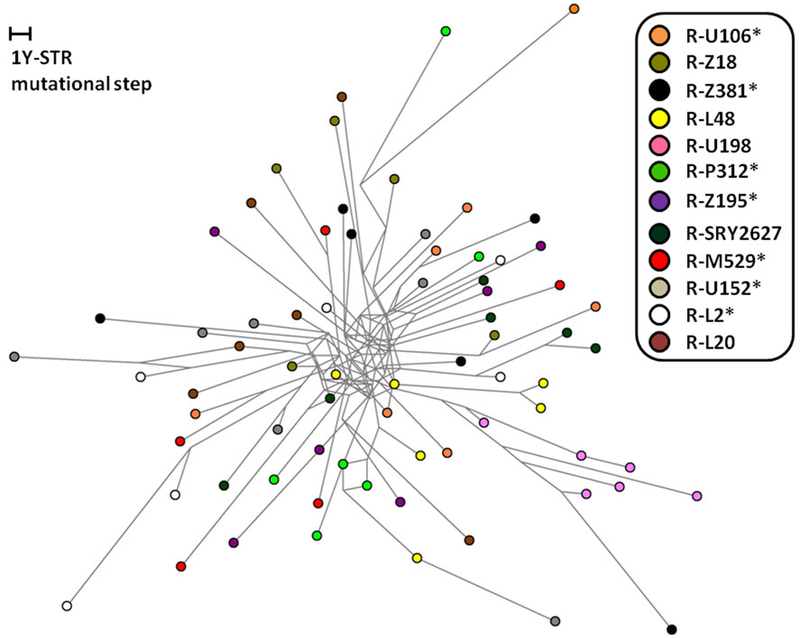 The three-way admixture in much of eastern Europe is not particularly surprising as history furnishes ample evidence for groups of steppe origin in the region during historical times. Some bequeathed their both language and name (e.g., Magyars), others only their name (e.g., Bulgarians) on the local Europeans, but records indicate a widespread presence of "eastern" groups in Europe from the time of the Huns to that of the Ottomans. 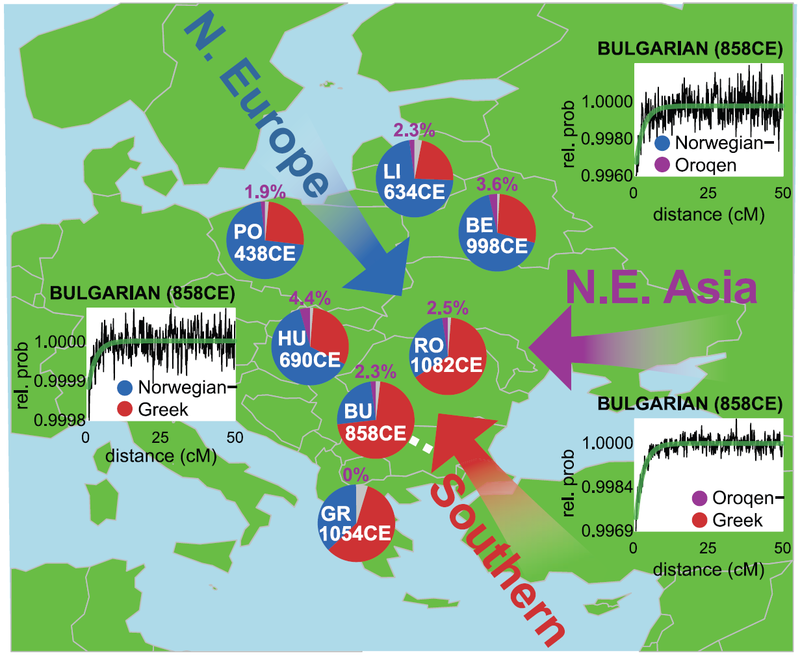 A study of late Antique eastern Europeans from the Baltic to the Aegean may help better document how the twin phenomena of the eastern invasions and the spread of the Slavs shaped the present-day genetic diversity of the region. I suspect that a few ancient samples will be far more informative for understanding the recent history of our species than the most sophisticated modeling of modern populations. Nonetheless, it's great to have a new method that maximizes what can be learned about the past from the messy palimpsest of the present. Ancient DNA has consistently managed to surprise us, with pretty much no direct genetic continuity revealed between Pleistocene and modern populations anywhere in the world. So, it is refreshing to see that at least in the case of the Americas the people who lived there ~13 thousand years ago are clearly related to the people who lived there in pre-Columbian times, with no real evidence of subsequent gene flows from Eurasia (at least in the case of Central/South Americans). Many people suspected this because of the difficulty to access the Americas from Eurasia: this must have limited gene flow between the two regions to a handful of migrants and a restricted set of time periods where geological and climatic conditions were advantageous. The much reduced genetic diversity of Native Americans also argues in favor of them being a relatively simple population, with low heterozygosity and a handful of unique "founder lineages" in both the Y-chromosome and mtDNA. Nonetheless, there are also several theories in the realm of alernative history, involving Solutreans from Europe, trans-Pacific boat riders, bearded "White Gods", Minoans/Phoenicians/Atlanteans/Ancient Egyptians, "African" Olmecs, "Caucasoid" Paleo-Indians, lost Israelite tribes, to mention only a few of the most well-known ones. The new study does not, of course, disprove any of the proposals in the preceding paragraph: one can still claim that diverse groups once inhabited the Americas and Rasmussen et al. (2014) just happened to chance upon one that looked just like modern native Americans. But, this certainly improves the odds of early "Native American simplicity", offering no evidence for the complexity postulated by many of the alternative theories. Moreover, while the existence of other human groups in the Americas cannot be disproved by the study of a single ancient individual, what can be proved is the antiquity of the ancestors of Native Americans. Rather than being late arrivals arriving from Asia after the initial colonization, perhaps with derived Mongoloid physical morphology, we now know that they were already there as early as ~13 thousand years ago. It is remarkable that a single ancient DNA sample can sweep away much of the nonsense that has been written on the topic in the past. A piece in Nature News addresses some of the "ethics" debate that seems ever-present in studies involving Native American remains. I don't know how this study will be perceived by living Native Americans: a possibility is that they'll be more receptive to ancient DNA research now that a team of scientists have stretched the time depth of their ancestry in the Americas to the earliest studied sample, revealing themselves not to be the evil-doers that western scientists are generally assumed to be according to a certain kind of mentality. A different -and more alarming- possibility, is that radical anti-science elements will be emboldened by these findings to claim that continuity with the earliest Americans (which in itself seems true enough) adds support to claims of ownership to pretty much all archaeological samples whose relationship to living Amerindians was hitherto uncertain in light of the many alternative theories. In any case, it is remarkable that this ~13 thousand year old genome now exists while the genomes of modern native Americans that can be had for a fraction of the cost and technical difficulty do not. Indeed, not even genotype data exist from most Amerindian groups from the USA, which creates the rather bizarre state of affairs that the Anzick-1 genome had to be compared with native groups from several countries in the Western hemisphere except the one in which it was found. I had mentioned this when it was in preprint form and now it has appeared in PNAS. The great advantage of preprints (and why I'm all for them) is that they allow us to look at research much earlier (about half a year in this case) and thus help accelerate the pace of information dissemination. One disadvantage is that it is sometimes hard to keep track of how papers change between the preprint stage (and there may be multiple versions) and the final published stage; perhaps we need a diff for scientific papers.